The Emmy Award-Winning creator of the show Vince Gilligan has partnered with the profoundly brilliant illustrator and cartoonist Ralph Steadman to create some totally new, limited edition Blu-ray Steelbooks. 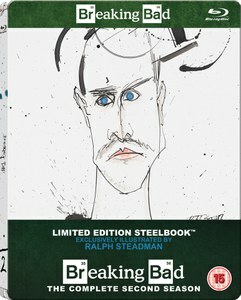 Emmy Award-Winning Breaking Bad creator Vince Gilligan has partnered with the profoundly brilliant illustrator and cartoonist Ralph Steadman to create some totally new, limited edition Blu-ray Steelbooks. These Steelbooks will have unique covers for each season, each dedicated to one of the six main characters - Walter, Jesse, Gus, Mike, Hank and Saul. All will feature exclusive, hand-crafted character illustrations by Steadman, the legendary illustrative mastermind behind Fear and Loathing in Las Vegas. This unprecedented creative offering will be available in single season presentations, exclusive to Zavvi.com in the UK.